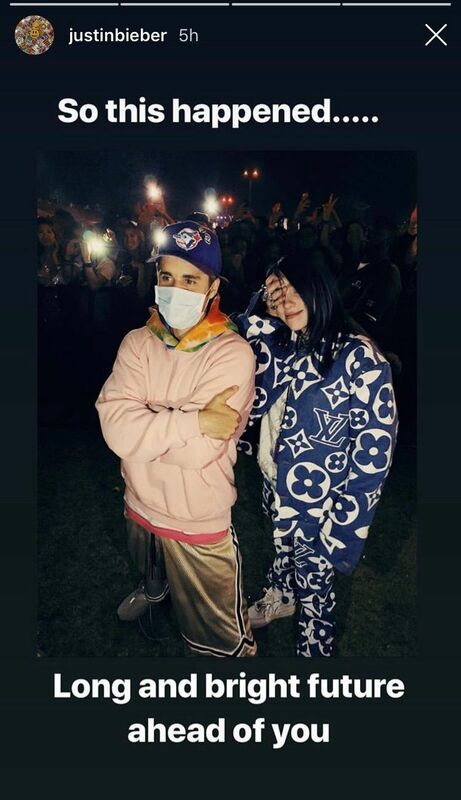 Longtime Belieber Billie Eilish has finally met her idol in person. She and Justin Bieber shared a hug while watching Ariana Grande's star-studded Coachella set, and a lucky stan captured the whole thing on video. ​Eilish has talked in numerous interviews about her tween Bieber obsession ("In my head, he was in love with me. It was, like, a relationship" she recalled last year), but recently confessed to Ellen DeGeneres that despite her music industry success, the two were yet to cross paths. In February she told Marie Claire she was afraid to meet Bieber, in case she cried in his presence. As far as we can tell, no tears were shed! But the two definitely connected, and their hug seemed genuine and heartfelt. Now 25 and taking a break from making music, Bieber can surely commiserate with Eilish about the joys and perils of achieving global stardom at age 16. Eilish is yet to publicly share her thoughts about living every Bieber fan's dream, but we know for sure that he was psyched to meet her. The older singer posted a picture of them posing in the Coachella crowd on his Instagram Story, and included a caption wishing her all the best: "Long and bright future ahead of you." Truly a meeting of minds. A collaboration seems like the next logical step, right? Hopefully Eilish invites Bieber to record in her bedroom studio sometime soon.